Qualcomm is really stepping up the game with its Snapdragon family of mobile chipsets. The wireless silicon company just announced its next, fourth generation of Snapdragon, codenamed Krait, made with the 28nm process. For comparison, the current Snapdragon chipsets, even the dual-core ones, are made with 45nm. 28nm means 1.5 times more power at 65% less power consumption than today's devices. The 28nm Snapdragon chipset will also have its single-core workhorse for affordable handsets, called MSM8930. It will start sampling early in 2012, and includes and integrated multimode LTE modem on the same chip, again a first. The GPU here is Adreno 305, which offers six times the performance of the original Adreno, but is slightly weaker than the Adreno 225 in the dual-core MSM8960. And, finally, with guns blazing, the quad-core APQ8064 is in the house. The four CPU cores can be clocked at up to 2.5GHz, and the Adreno 320 quad-core GPU offers 15 times the performance of the original Adreno. This one will also start sampling in 2012, and is mainly tailored for tablets, notebooks, and other computing devices, rather than smartphones, since it supports desktop-grade memory, the PCIe interface, and multiple USB ports. "All chipsets in the family will integrate a quad-combo of connectivity solutions — WiFi, GPS, Bluetooth and FM — and include support for near field communication (NFC), as well as stereoscopic 3D (S3D) video and photo capture and playback. Support for every major operating system, across all tiers of products, comes standard on all Snapdragon chipsets. 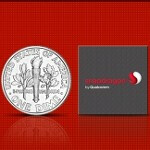 ", as per Qualcomm's press release. Not that we need Full HD 1080p 3D video capture with up to four cameras at once on our phones just yet, but it's nice to know you have options. We think Nokia should snap one of those for its next generation 1GHz Symbian devices, or the Nokia Windows Phone crowd, don't you? Watch a video walkthrough of the mobile gaming capabilities that the Snapdragon GPUs offer below.